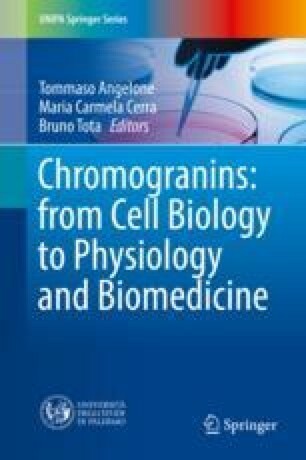 Chromogranins (Cgs) are the most abundant intravesicular proteins of chromaffin granules. Using Cgs knockout mice, we found that the lack of chromogranin A (CgA), chromogranin B (CgB) or both drastically reduce the vesicular content of catecholamines (CA), impair its accumulation in granules and largely affect the kinetics of exocytosis. Conversely, the overexpression of CgA induces the genesis of vesicles, increases their quantal content and even transforms non-secretory in cells capable to secrete substances. We conclude that Cgs contribute to a highly efficient system that directly mediates monoamine accumulation and regulates the exocytotic process. We dedicate this review to Prof. Hans-Hermann Gerdes who passed away in August 18, 2013. He largely contributed to enhance our knowledge of the functional roles of chromogranins. LC is the recipient of a fellowship from the Fundación CajaCanarias. This work is partially funded by the grant BFU2013-45253-P from the MINECO (Spain) to RB and JDM.